Hand made by Switzerland's Sirch, this is one of the new classics made by Sirch. Just when you'd resigned yourself to watching your tot zoom up and down halls and around the park on a plastic mass-produced push toy, along comes the modern Max car and Lorette Trailer from Switzerland. 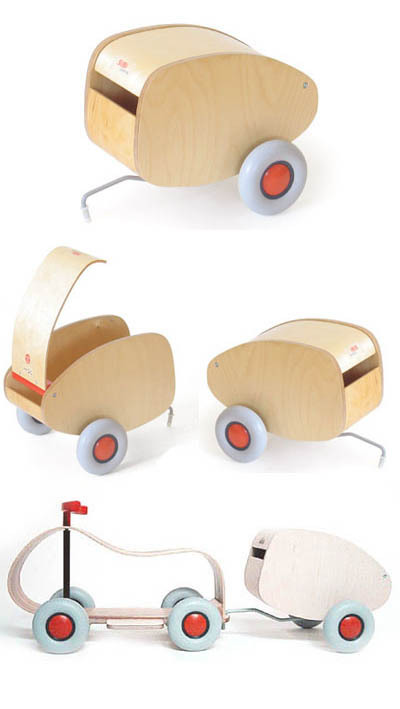 Features steam-curved plywood and "whisper-quiet" plastic wheels that can be used both inside and outside. There's a matching Push Car for Lorette called Max. Unlike your usual first-ride car toys, the minimal Lorette comes minus the distracting bells and whistles, so it's just Junior cruising along the wide open road of his imagination (which was really the point anyway). But be forewarned, with a starter set of wheels this stylish, a mini Aston Martin may not be far behind. Size: ca. 13" long x 10" wide x 14.5" high.